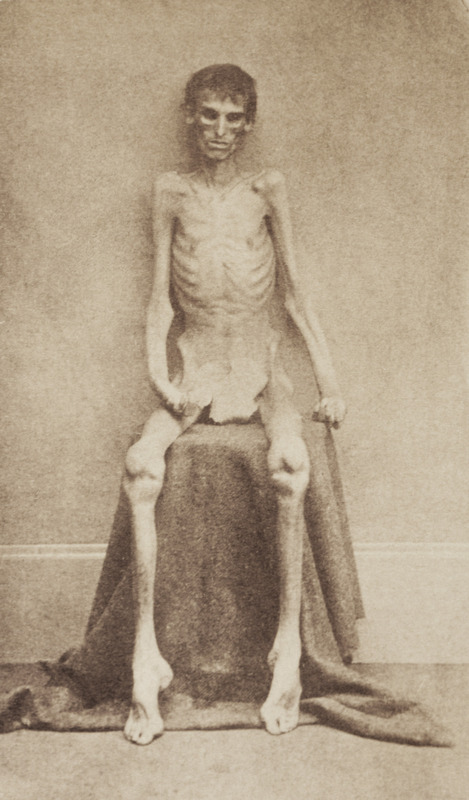 This is a photo from the U.S. Library of Congress depicting a survivor from the CSA’s notorious Andersonville Prison. Andrew Jackson Beaty died in this prison. One of the most disturbing stories I have come across in my family history research involves the Beaty family during the Civil War. The region where they lived became a blood bath for soldiers and civilians during the War. Although, I have covered some of the story in articles about Champ Ferguson and Tinker Dave Beaty another big part of the story involves three Beaty men and their brother-in-law from my direct family line. To give you a feel for what the Beaty family was dealing with between 1860 and 1865 (and probably a few years beyond that), here is a little backstory. They lived in Fentress County, TN — just across the state line from Albany, KY. Although overall, the larger region (at least 6-8 counties) was very divided in its loyalty to the Union and the Confederacy, when the War broke out Fentress County was filled with a significant amount of Union supporters — including the Beatys. This immediately created a problem for the Beatys since Tennessee succeeded from the Union. Across the line in Kentucky was, at least in theory, a more favorable situation since it was a neutral state (although the Union did supply the Home Guard with guns and ammunition). But quickly after the War began the area fell under the control of Home Guard units from both sides, renegade bands, vigilante groups causing a rapid descent into a nearly lawless environment. Adding to the situation was the difficulty of moving organized armies through the wooded and mountainous area of northern Tennessee. This blend of difficult-to-navigate land, a community of independent people, mixed political loyalties and minimal law enforcement were the ingredients for a perfect storm. What is difficult to completely verify is whether or not the Beaty family stayed in Fentress County during the War. A significant number of civilians headed north through Albany at the outbreak of the Civil War and I believe the Beatys may have been a part of that group for a several reasons. The family does not seem to suffer any civilian-type atrocity, they appear to lose land holdings after the War (which could be because it was determined their land was ‘abandoned’), and a letter written during the conflict by a Beaty cousin mentions the oldest son, Jonathon “being in Kentucky with his family.” Of course, this could simply mean the Beatys were across the state line, in the Albany area — but it could also mean they went further north. Regardless of whether I am accurate or inaccurate on my theory of where they were during the War, they still paid a very high price during the conflict. My grandfather from that generation was Alexander Beaty. His father was a Overmountain man and based on the name of his children, Alexander was very patriotic and a Union supporter. Alexander’s three oldest boys, Jonathon, Andrew Jackson and Thomas, and a son-in-law, Andrew Owens, fought in the War and are mentioned in a letter written by Morgan Hull [pdf]. I can inform you that Andrew J. Beaty and Thomas is here and well. Jonathan A. Beaty is gone home the rest of the boys is all well. – Morgan Hull, Co. B 2 East Tenn Regiment Infantry, Bowling Green, KY, Dec. 18, 1862. Hull appears to be a first cousin — son of their father’s sister, Nancy Agnes, who married Jonathon Hull. In a second letter written by Hull he notes than Jonathon Beaty is with the family in Kentucky [pdf]. The unit the Beatys were in, Co. B 2 East Tenn Regiment Infantry, fought in several skirmishes and was also engaged in the Battle at Mill Springs (near the Monticello area) where the Rebels were defeated. It was the battle at Rogersville, TN on November 6, 1863 that forever changed the family’s life. Jonathon, Andrew and Thomas and other men from the Co. B 2 East Tenn Regiment Infantry are captured. I am not certain if their brother-in-law Andrew Owens or cousin Morgan Hull were also captured, but odds are they were since 609 men from the regiment died due to disease. This is because the men from the regiment were transferred to Belle Isle prison in Virginia on November 13 — about a week after their capture — one of the worst prisons of the War. The prison would later scrutinized for its inhumane treatment of its POWs. In 1863, the prison held 10,000 men, but had only 3,000 tents for the men to survive in. Although the Confederacy would later deny the charge, food sent by the Union to feed the captured men was instead sent south by Confederate soldiers to feed their soldiers. So Union soldiers like the Beaty men were forced to endure the hardships of harsh weather conditions while being underfed — leading to an extremely high mortality rate. Surviving soldiers and diaries of dead soldiers suggest that between 25-40 men were dying daily at the prison. Andrew Beaty would be the first of the Beaty brothers to die. He died about three months after his capture on Feb. 15, 1864. Like most of the men, he died from exposure to the elements and starvation — although the official cause of death in his records state he died of pneumonia and diarrhea. Thomas survived until May. At some point, he was transferred to the Andersonville prison (another prison notorious for its ill treatment of captured Union soldiers). He died May 16, 1864 and is buried there (Grave No. 1137). I have been unable to determine the fate of Jonathon Beaty and Morgan Hull. I don’t think the war can last much longer and I hope through the mercy of God the time may not be far distant when we can see each other in peace. Morgan had no way of knowing the horrible fate he and others would face in just a few short days. Trial of Captain Herry Wirz (Commander at Andersonville prison). He was tried and executed for war crimes. He is one of only two Confederate soldiers to meet this fate after the War ended. Champ Ferguson was the other one.